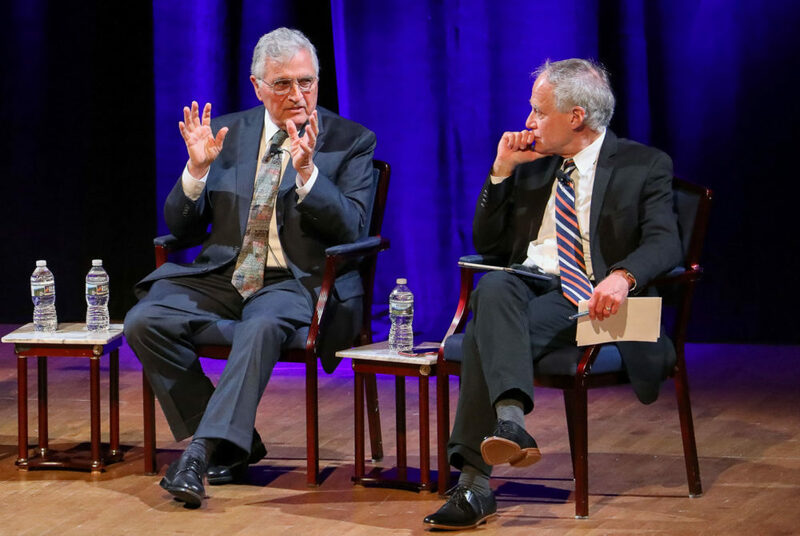 Apollo 17 Astronaut Harrison Schmitt speaks to moderator Jeffrey Kluger, an editor-at-large at TIME magazine, at Monday night's “Apollo plus 50: The past, present and future of the space program” panel. Three panelists spoke about the past and future of space exploration at a discussion in Lisner Auditorium Wednesday. The event, titled “Apollo plus 50: The past, present and future of the space program” was part of ScienceWriters 2018, a five-day conference of meetings, workshops and talks organized by the National Association of Science Writers and the Council for the Advancement of Science Writing and hosted at GW. The panelists discussed topics like climate change, private industry space travel and American competition with China. Jeffrey Kluger, an editor-at-large who oversees science coverage at TIME Magazine, led the conversation, first asking panelists how they feel about the future of space exploration. Valerie Neal, a space history curator at Smithsonian National Air and Space Museum, said an individual’s answer could vary based on when they grew up. People who grew up in the Apollo-Era remember manned missions to the moon happening in their lifetime, while younger generations do not. College students “don’t have the concept today that the United States could have that unity of purpose, that kind of widespread popular interest and support, the kind of space program that we saw in the 1960s,” she said. She added that a manned spaceflight mission beyond the International Space Station could increase youth interest in space. “They’re also commercial competitors, as China is in many other areas, so there’s really an international competition at stake,” Pace said. With respect to cooperation between the two countries, Pace said that historically, the United States has had trouble establishing trust with China. He recalled a time that China initiated a lunar impact and did not share details with the United States despite prior data exchanges. He cited U.S. laws that prevent the open exchange of lunar data and samples without congressional approval. In a moment that provoked verbal backlash from some audience members, Schmitt said that as a geologist, he does not think there is enough evidence to prove that human activity is causing climate change on the Earth. About 90 to 100 percent of climate experts agree that humans are causing global climate change. “Normally, we have always assumed up until the Industrial Revolution that climate change is a function of the solar cycles, and indeed there’s still very strong evidence that this is the case,” he said. He added that when NASA gives out grants, scientists have an incentive to alter their conclusions to align with the organization’s desired outcome.